All Saints’ Episcopal Church and Preschool is offering a “Service Year” Ministry Internship for a young adult interested in exploring a vocation in ordained or lay ministry, and/or education, and/or community outreach/organizing. The Episcopal Church in Hawaii began in 1862 when King Kamehameha IV and Queen Emma invited the Church of England to Hawaii. The King and Queen supported the Church’s establishment throughout the islands. All Saints’ Episcopal Church was founded as Kaua’i's first Episcopal Church in 1924 and moved to its current location in Kapa’a on the Island of Kaua’i in 1925. The Church is located two blocks from the beautiful Pacific Ocean. All Saints’ thrives as an inclusive and dynamic spiritual community of faith. All Saints’ vision is to be a cathedral for the people of Kaua´i—a center for worship, education, outreach, and the arts. As a Church in the Episcopal Diocese of Hawai’i, All Saints’ is a member of the worldwide Anglican Communion that joins together over 70 million members in 163 countries. The Episcopal Church is rooted in the historic teachings of Jesus Christ and nourished by thoughtful engagement with the Christian Holy Scriptures. Worship, grounded in the Book of Common Prayer, is at the heart of who we are as a community of faith and seeks to honor the values of tradition, inclusivity, and transformation. Sunday services are held at 7:00AM (Said service) and 9:30AM (With Sunday School, Music, and Choir). All Saints’ offers a Wednesday Eucharist Service with healing prayers at 8:00AM. All Saints’ Preschool is one of Kauai's premier early childhood education centers. All Saints’ Preschool is committed to nurturing and inspiring their students to “Realize Their Personal Best” amid a loving, innovative, and dynamic early childhood educational environment. The Preschool’s goal is to provide the foundation necessary for its students to thrive emotionally, physically, intellectually, socially, and spiritually. Approximately 40-50 students attend annually the Preschool. The intern will work approximately 32-40 hours a week, which will include Sunday mornings and some occasional evening responsibilities. The intern’s primary community will be the ‘Ohana of All Saints’ and those All Saints’ serve in the community. Their extended ‘Ohana will be the people of Kaua’i. The intern will work closely with the Rector and Head of School of All Saints’, The Reverend Ryan D. Newman. Elementary Christian Education: Assist in overseeing the success of the Sunday School program—much of which can be accomplished leading up to Sunday. All Saints’ has a Sunday School curriculum and many volunteers—an intern’s role will be to get the best out of the curriculum and the volunteers. Outreach (Participant and Prophet): All Saints’ has numerous outreach endeavors including our cornerstone outreach project of Laundry Love Kauai. An intern will not only serve in these ministries; but, we hope they will lead and dream up new outreach ministries/opportunities. 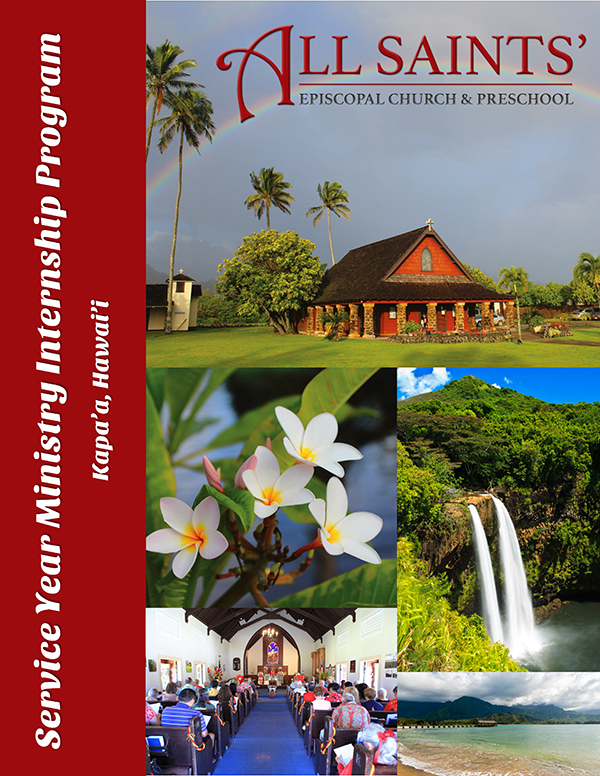 Ministries of Worship and Prayer: An intern will be given countless opportunities to experience and explore the practical life of being a ministry leader in an Episcopal Church and a lay/ordained pastor to a broader community. “Ka Ohana ‘o Ke Akua”:We are committed to offering our interns an ‘Ohana (family) seeking to live out Jesus' commandment to love one’s neighbor as oneself in a literal and purposeful way. In Hawai’i, the ‘Ohana is the core of any community. Our baptism covenant calls us to seek and serve Christ in all persons, loving our neighbors as ourselves and to strive for justice and peace among all people, and respect the dignity of every human being. The intern will live out Jesus’ message by being in community with those most in need. At All Saints’, an intern will be given ample opportunity to work with and serve the underserved and forgotten members of our island community. It is our hope that interns will utilize these experiences to continuing shaping and articulating their world view and their vision to building up the Kingdom of God. Where does God fit in all of this and where do I fit in God’s plan? The intern will be provided a spiritual director through All Saints’ partners at the ReSource for Christian Spirituality. In addition, All Saints’ will encourage and assist interns in utilizing the vast resources of vocational/professional resources available in the congregation and the greater community. The intern will be housed on the campus on All Saints’ in the Rectory’s Cottage—a standalone, studio with a full kitchen and bath. Utilities, including internet access, are provided in the Cottage. Access to the Church car and bike will be made available. The cottage is located two blocks from the beach and the heart of downtown Kapa’a. Miles of beaches, hiking trails, and lush mountains will be an intern’s front and back yard. Kaua’i is a place of simpler living surrounded by the magnificent beauty of God’s creation. We encourage interns during their year of service to “simplify.” Simplifying does not mean an intern is expected to forego modern conveniences and necessities. Rather, we hope an intern will focus on the basic necessities of life and defining an existence that is not dependent on material goods. ELIGIBILITY: Must be a U.S. citizen over the age of 21. All Saints’ will provide round-trip airfare from an intern’s legal place of residence to Kaua’i. In addition, All Saints’ will provide a monthly stipend to cover basic necessitates (ie. Food, toiletries). The intern will be given two weeks (14 days including 3 Sundays) of personal time but the time cannot conflict with Christmas Eve/Day, Holy Week and Easter, and Holy Sovereigns’ Day (Middle of October). Travel expenses incurred during this “personal time” is the responsibility of the intern. The intern will also be required to participate in one professional development opportunity during their internship (ie. Conference, retreat), which All Saints’ will fund pending approval of the rector. Applicant must fill out an “Internship Application” which includes written essays. Submit (in PDF form) a current resume. Submit transcript of any college or graduate level work. Submit three references (Name, phone number, and email for each). Good references include professors, volunteer or work supervisors, campus ministers, pastors, coaches, advisors, and mentors. Please do not use family members or friends as a reference.